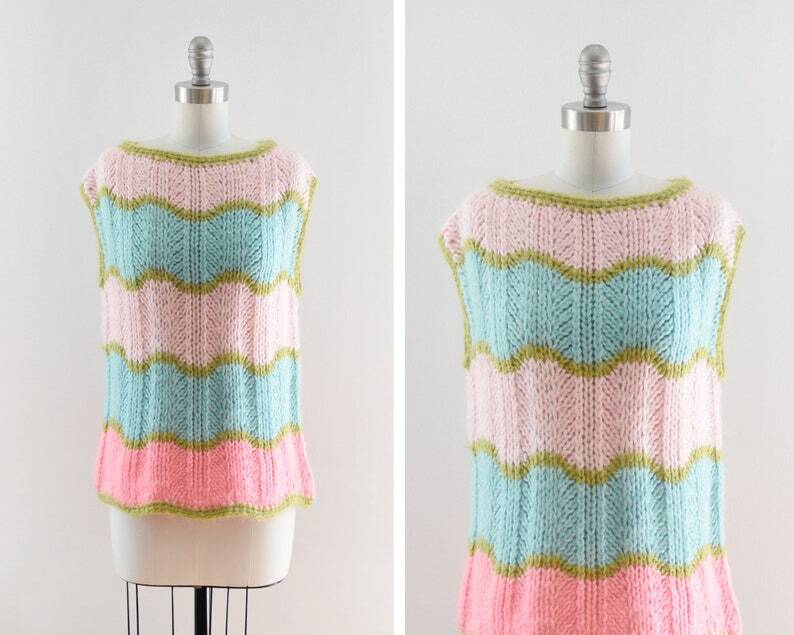 Cute vintage 80s sleeveless sweater. Thick chunky ribbed knit in light pink, got pink, baby blue, and olive green. The knit is a little fuzzy and and has some stretch. Condition: Excellent vintage condition (see description for any flaws). This garment has been cleaned and is ready to wear. The size is just an estimate (unless stated on the tag), and vintage sizes are different than modern sizes. Please use measurements to ensure proper fit. I accept both paypal and credit cards directly through Etsy, please choose your preference when you check out. Please read the store policies before purchasing. This came quickly, incredibly well packaged and is a truly beautiful specimen. He will love it. This dress is absolutely gorgeous and in perfect condition! Rust Belt's description and measurements were right on, and speedy delivery. I'm thrilled with my purchase and can't wait to wear it! Measurements are taken laying flat and are now doubled when applicable (bust, waist, hips). The size is just an estimate (unless stated on the tag), and vintage sizes are different than modern sizes. Please use measurements to ensure proper fit. To determine whether a vintage item will fit you is to compare the measurements given with that of a similar garment that does fit you. Glassware: I assume no responsibility for glassware once you have received/used it. 99% of vintage glassware cannot handle a dishwasher and should only be hand washed with care. It's best to use a mild detergent and soft sponge, towel, or even your hand when washing these glasses. Clothing: Most of my items are cleaned before listed, but it's always best to rewash or dry cleaned before wear. 8.75% sales tax added for NY state residents. All items are pre-owned, please expect natural wear. I do my best to note flaws but may overlook small things from time to time. Detailed and accurate measurements are provided on every item that is listed. It is the buyers responsibility to check the measurements and ensure it will fit properly. Materials can degrade over time, which is something you should keep in mind, particularly when buying vintage shoes. I do my best to check over each item for any flaws or material degradations. However, I do not have the ability to know how much wear a vintage item can handle before it becomes unwearable/unusable. I do accept returns on items. Items must be unworn and sent back in the same condition as they were sent. Please contacting me within 5-14 business days of receiving your item. Some garments might be clipped to show how the clothing should fit properly. Colors vary from monitor to monitor. Accessories not included, unless stated in the listing. Please consider this when purchasing. Please feel free to email me if you have any questions or problems with any purchase! I do offer layaway for items in the shop. Please contact me to set up a payment plan.